Flexible – Light and portable voucher printer ergonomically styled for retail environment. Promote your store – Brand your logo on each voucher for additional advertisement. 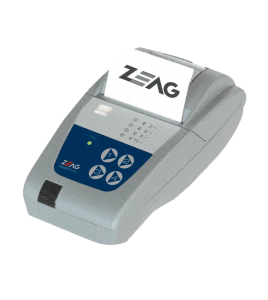 Analysis of discounts – Every voucher is statistically registered and can be analyzed per account through the Zeag Management System.. The ValiPrint is a simple and easy to use printer to issue barcode discount vouchers. A typical application is in retail shops that offer discounted parking fees to customers that buy goods from the store. The voucher is printed by the shop staff and handed to the customer. Payment or exit stations will then scan the barcode and re-calculate the fee with the pre-determined discount. Multiple discount vouchers can be used..